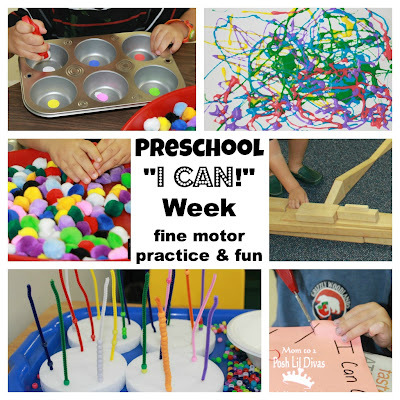 Last week in preschool our theme was "I Can". 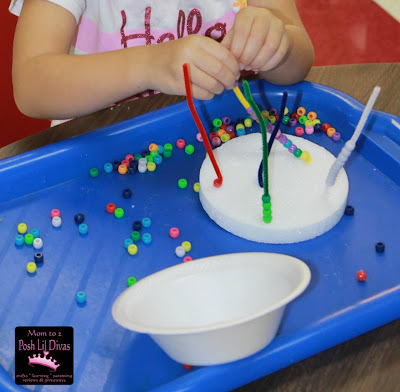 It was aimed at making the children feel successful about things they can do, getting them comfortable with basic tools and materials used in preschool, introducing basic skills that we will be practicing over the course of the year and of course trying new things as this is the first school experience for many of my students. I have to say that I am finding it difficult to capture all we do. It's not as easy as when I am home with only my 2 Lil Divas. These kiddos are quick, things get messy pretty fast and I find myself needing more than just my two hands if I truly want to capture it all. Unfortunately, I don't have a photo of the final product but I put lots of odds and ends we did throughout the week in an "I Can" Book that the students took home to share with their families at the end of the week. It had pages inside that celebrated things the kids could do like - I Can Cut, I Can Paint, I Can Glue, I Can Draw, I Can Tape and I Can Stamp. The parents loved it! Here are a few of the activities I did manage to capture either via my phone or camera. I snuck in lots of fine motor practice, sorting and color recognition into our week. 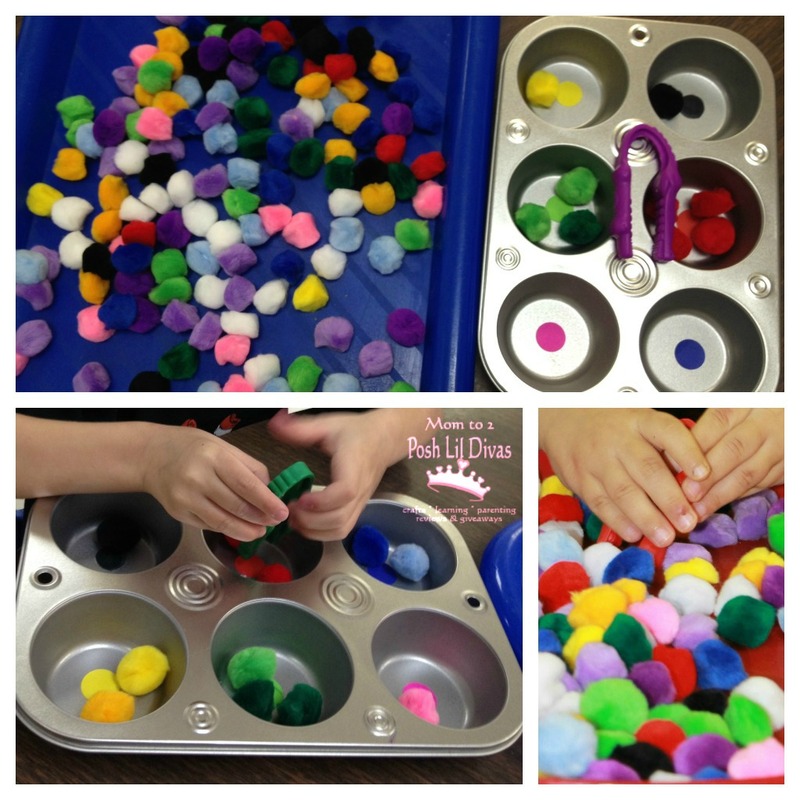 We used pincers to pick up colored pom pons and place them in the correct section of the muffin trays. I picked up styrofoam circles (used for floral arrangements, etc) from the dollar store and stuck pipe cleaners in them. Then I had the kids pick colored beads and bead them onto the correctly colored pipe cleaner. This was so easy to whip up and such a great activity for little hands. I can not tell you the focus on the kiddos faces as they sat and worked on these! It was priceless. We had fun building with wooden blocks, legos, Lincoln Logs and various other toys we have in the classroom. I can honestly say that through our play we worked a lot on teamwork, cooperation and sharing - skills that are crucial to build in preschool. Scissor skills and fine motor practice. 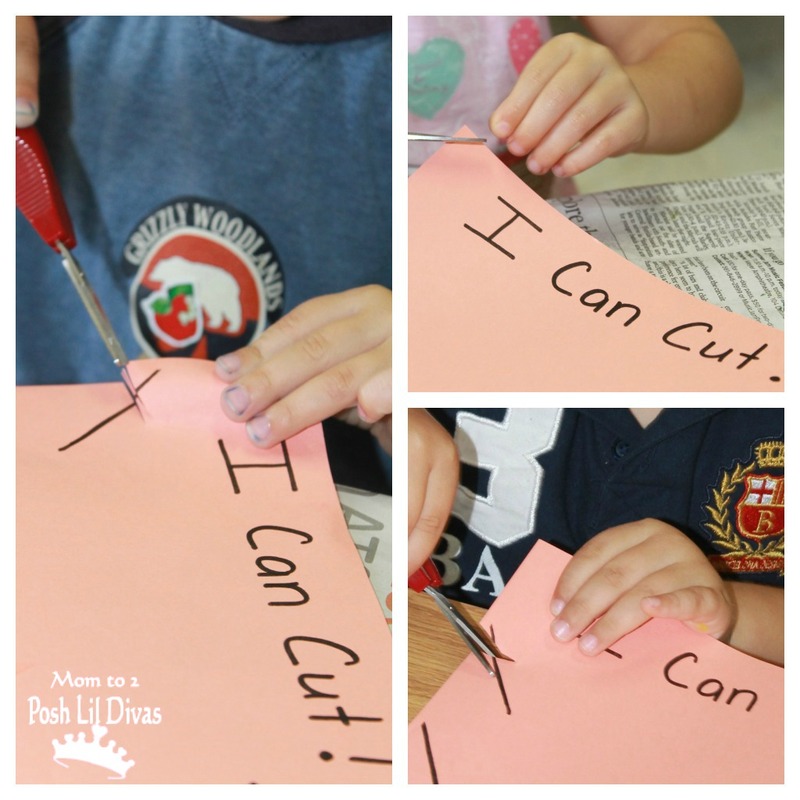 Many of my kiddos have never used scissors before. They LOVE them - seriously, they grab hold and get snip happy. I have to make sure I keep lots of scrap paper paper. We have these great lightweight starter scissors (clickable photo below for more info) that we are using at the moment in addition to regular child sized scissors. They are fab for beginners! The kiddos love them. I mixed some colored glue (add food color to your regular glue & stir to mix well) and let the students have at it! They thought this was the coolest thing ever. The artwork dries shiny and has feels so cool to touch. We have them displayed on our Masterpiece Wall and they look fabulous. The kids also did some stamping with various stamps and ink pads, cut colored tape and stuck it to paper to make art, drew pictures using markers/crayons, painted at the easel, and lots more practical skills like cleaning-up, helping with classroom jobs, dressing themselves after using the bathroom, opening their lunch/snack bags, etc. We are a class of busy little bees and our mornings are filled with activity. 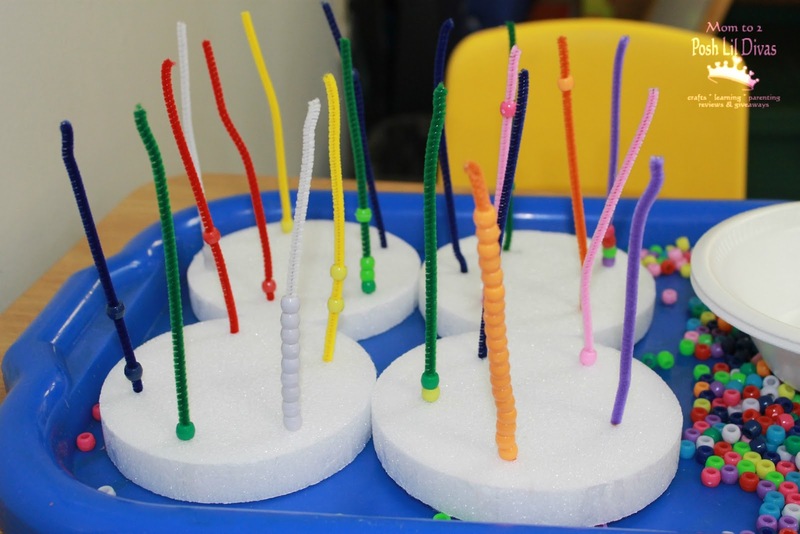 Please note, that while none of these activities are new or earth shatteringly fascinating to the casual observer they were mostly new experiences for the children and presented lots of opportunity for hands-on, sensory fun and learning for the little hands and minds in my classroom. I hope you will be inspired to spend some time celebrating what your kids can do! Kids feel so great showing off abilities, exploring & discovering that they can do things that they may never have tried before. Next week I will be sharing our Friendship Week fun. Beth, they were great for little ones. The kiddos were totally attentive and laughing, etc. Hope you enjoy them. So much fun with learning! I love the idea of I can! Cassie, it was a great week. I found that with school being new to so many of my little ones - they kept telling me they couldn't do things. I can't cut, I can't lace, etc. It hit me that I wanted them to feel more confident and comfortable about trying new things so I Can Week was born! I'm so glad I did it, they were beyond proud of the little books they got to take home to show off all the things they "can" do! Meghan - I just added some food coloring to the glue to get colors. 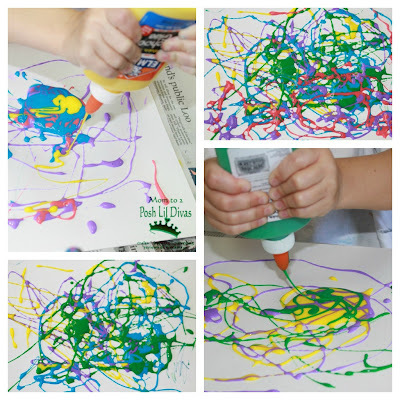 It works great and the colors were nice and vibrant once our art was dry! I want to go to preschool! Holy, seriously - isn't it the best time ever! My girls see me prepping stuff for my class and they wish they could go back, hehe. Meghan, instead of trying to put paint in glue bottles, just add some food coloring to your white glue. It turns the glue into paint! Thanks for sharing that Mary! I replied right under her comment as well so hopefully she sees it. Food coloring was so easy to use and worked great for us too. What a fun week at preschool. My guy misses the entire wk because he was sick. I hope this week is this much fun for him. I love your preschool weekly wrap-ups! What lucky kids! I'm so glad your new job is going well. Great ideas! I've pinned several of them. I found you via our Teach Preschool group on Google+. Thanks so much for the inspiration - I'm going to try some of these with my son! Loved the idea cannot wait to try it with my class. Guys, check out this page to learn more about different literary terms. I think that schools should hold such events, they are interesting for students. I also want to advise the site for students customessaymeister . There is a lot of useful information and examples of essays.